I think you all know by now that I am a massive skincare junkie. Imagine my excitement when I was casually strolling (read: in hyper shop-mode) down the Rue St. Honoré when I was in Paris and stumbled upon an Aesop store. Not just a small selection on a webshop but a full fledged boutique that smelled like heaven. I chose to go straight for the gold as I didn't want to get enchanted by the smell and feel of the many products and the lovely French woman grabbed me the Parsley Seed Cleansing Masque. Aesop is a brand from Australia that makes products for the skin, hair and body. They use both plant-based and laboratory-made ingredients of the highest quality, particularly those rich in anti-oxidants. I especially like their clean, almost medicine-like packaging. Metal tubes, little glass pots, it's all so pharmacy to me. 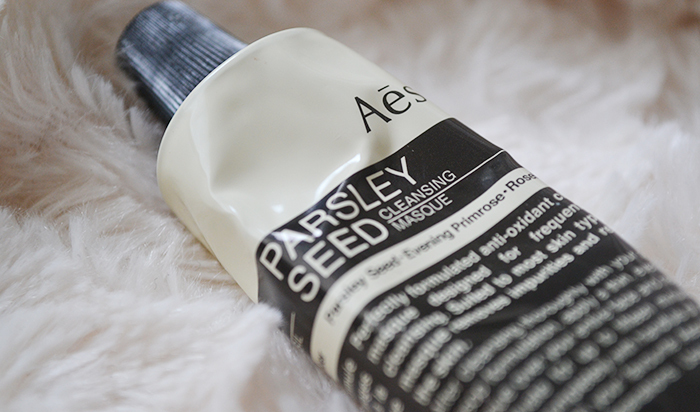 The Parsley Seed Masque is a clay-based mask that is supposed to deeply cleanse the skin and rid it of impurities clogging the pores and causing breakouts and redness. Another clay mask I use is the Origins clear improvement active charcoal mask. Although that does a wonderful job at deep cleansing my pores, it's a bit too harsh in the winter months, leaving my skin feeling tight and a little stripped. There's none of that with the Aesop mask. It's gentle but effective. It calms redness and soothes breakouts better than any other mask I have tried. My skin is left feeling gorgeously smooth and soft, without any tightness. It goes on nearly undetectable, but once it dries it looks nothing like that. It looks like a dried piece of clay on your skin, and you will notice that it dries in patches. Some patches of your skin will look whiter than others. I have no idea why this is. Maybe these are the spots where there was less gunk to get out. I am really glad I tried this mask as it has great detoxifying properties and helps rid my skin of any breakouts and redness. I particularly recommend it if you have troublesome skin that is sensitive at the same time. In the short time I have owned it it has become a staple for me. I might even be talking holy grail status here.